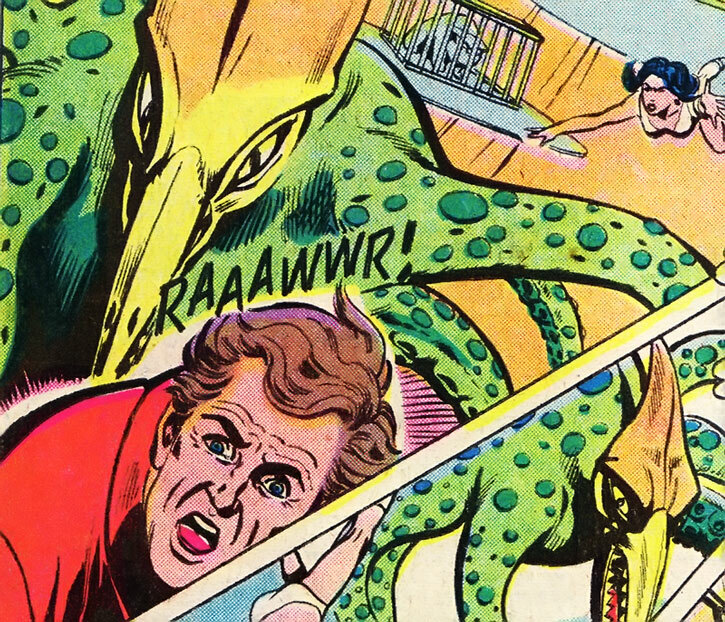 The Alien Animals File is a bestiary for some of the exotic alien creatures encountered by the Legion of Super-Heroes. It is my hope that it will be a fun and handy resource for any GM or writer. Like a Dungeons & Dragons Monster Manual, the Alien Animals File is full of critters, some very powerful, that can be useful in a variety of settings. I began working on this project for a profile on Chameleon Boy, and the Alien Animals File is certainly handy in any campaign featuring shapeshifters. But the creatures here could be found in any space opera (Star Wars, Star Trek) or fantasy world (Xanth, Middle Earth, The Wheel of Time), and even in exotic or hidden locales on Earth (Loch Ness, “the center of the Earth”, Skartaris, The Savage Land, Monster Island, Dinosaur Island, etc.). You might encounter one of these beasts in Asgard being slain by the Warriors Three, in the Forbidden Forest at Hogwarts being fed by Hagrid, on an asteroid attacking the Millenium Falcon, in Tōkyō battling Godzilla, or in Subterranea, aiding the Mole Man against the Fantastic Four. Each creature profile begins with a set of game stats for the DC Heroes RPG by Mayfair Games. Non-gamers, don’t despair; there is also a text description of the creature, including its abilities, appearance, and importance to the Legion. Of course, there are illustrations of the animals throughout the document as well. Note that the Alien Animals File isn’t complete and will gradually expand. An awful lot of creatures have appeared in the many decades the LSH has been around, and there are still many more that I intend to profile. Of course, I won’t get to them all; many of them appear in only 1 page (sometimes just one panel) of a comic. Only those that are most striking (because they’re important to a story, because they are visually interesting, because someone requested them, etc. ), in my opinion, are included. There is limited information available on even the best known creatures, so speculation and educated guesses are necessary for each creature profile. I’ve explained some of my assumptions in the section of technical Design Notes found below. This bestiary was originally arranged alphabetically, but I’ve discarded that idea. You can always do a word search if looking for a particular animal by name. The current organization groups animals by habitat. That allows me to talk a bit about the settings where they might be encountered, and lets us group animals that might be encountered near each other. That makes it easy for GMs to find beasts that “go together” and in my opinion makes the writeup more interesting for a casual reader. The Table of Contents lists the current ’chapters’ of this document, both those already written and those that are still forthcoming. 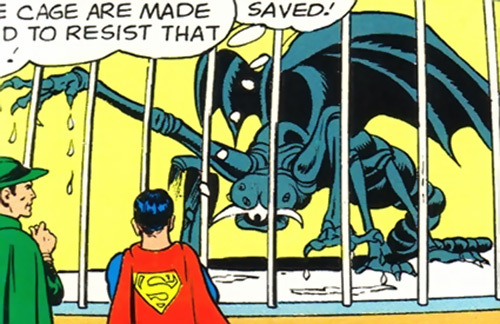 Section I details The Legion of Super-Monsters gathered by LSH foe Monster Master. 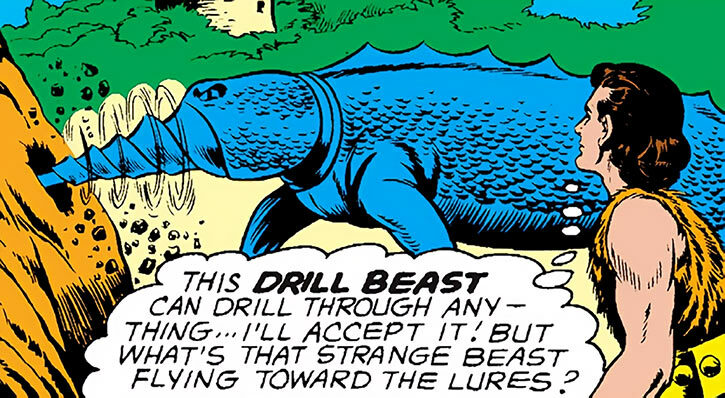 Their number includes the Driller Beast, Omnibeast, Eye-Monster, Mirror Monster, and the mighty Earthquake Beast. The Super-spinner Beast and the deadly Gas Creature were rudely rejected for membership in the LSM, but we have righted that ancient (future) wrong, and included them as well. Section II is concerned with creatures from Vorn, The Hunters’ World, a skilled hunters’ paradise…or graveyard. Section III, The Terran System, details those creatures improbably identified as being from our own solar system, mostly from Venus, Mars, or the moons of Jupiter and Saturn. Section IV (forthcoming) is small but important, as it profiles The Lightning World of Korbal, a planet with a special place in Legion lore. The most important creatures listed here, perhaps the most important in the entire document, are the Lightning Monsters which empowered Lightning Lad/Live Wire, Lightning Lord, and Lightning Lass (aka Light Lass or Spark). Section V (forthcoming) is for the few beasts known to be natives of Lallor. Lallor isn’t as important as Korbal, but is worth mentioning. 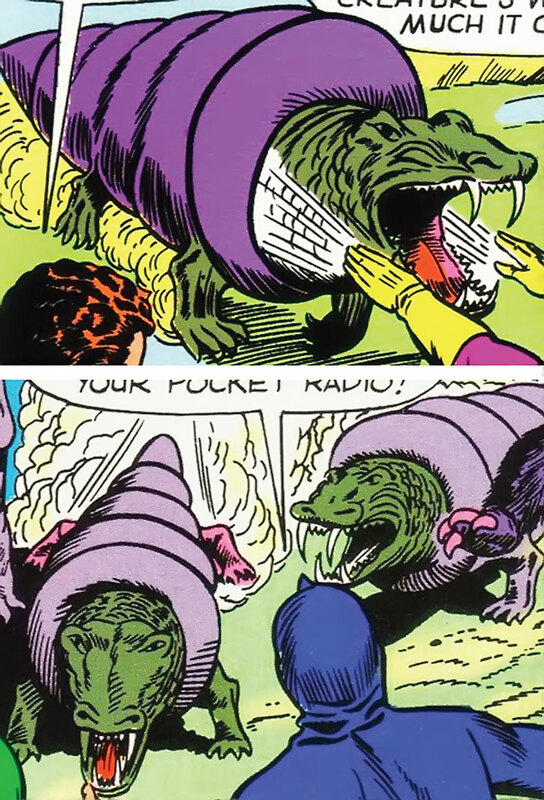 We know of Lallorian animals through the shapeshifting powers of Lallorian hero-turned-villain-turned-martyr Beast Boy. Like the other Heroes of Lallor, he’ll one day have his own profile. Section VI, Wandering the Wilds, is a catch-all, miscellaneous section for creatures not endemic to any region already covered. This will include creatures whose homeworld is unknown; creatures who are the only known beast from their world; and creatures found in deep space. There are a suprising number of those, and they may eventually break out into their own section. But for now, the current final section is Section VII (forthcoming), The Planteaters, and is not concerned with herbivores but with ambulatory, active plants from around the universe, some of them deadly. 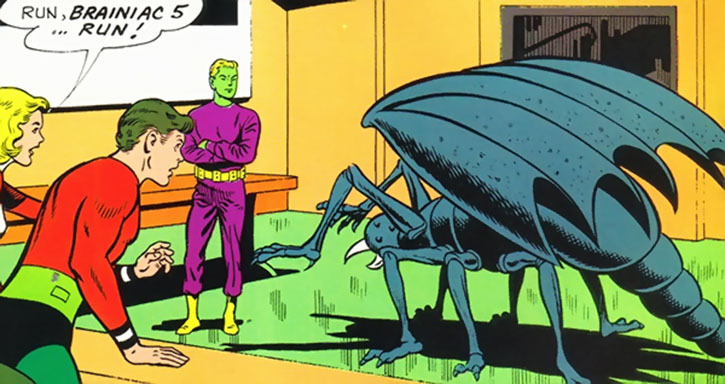 Early in their history, the Legion of Super-Heroes battled a foe called Monster Master. 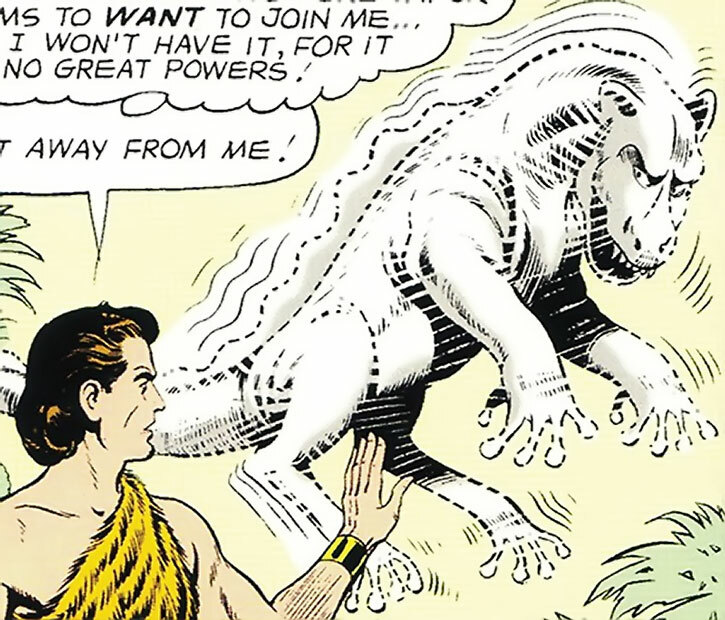 He used his powers to control and exploit five super-powerful creatures which he called the Legion of Super-Monsters. 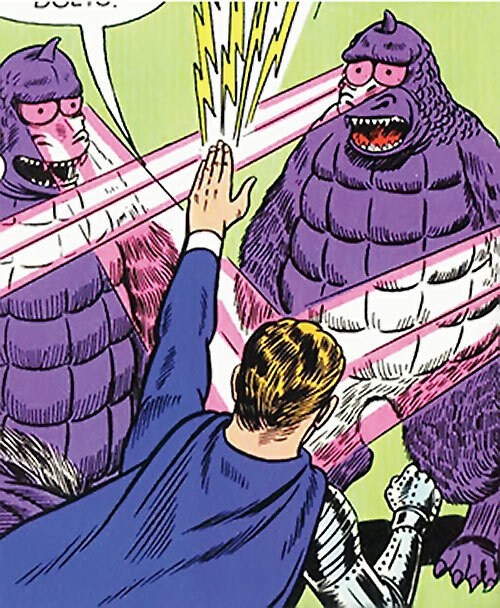 Under his influence they clashed with the Super-Heroes and served as the “muscle” for Monster Master’s crimes. 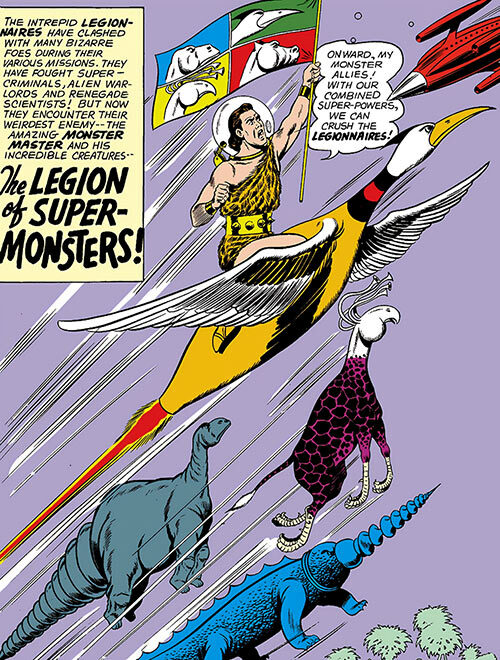 Because of their significance (and to make it easier for GMs to locate their stats), the species that made up the Legion of Super-Monsters are given pride of place and listed first here in the Alien Animals File. Two creatures which Monster Master rejected are also listed here, as they are also from Monster World and one of them plays a major role in Monster Master’s story. Listed in the order they were recruited, we have the Earthquake Beast, Eye Monster, Mirror Monster, Drill Beast, and Omnibeast, followed by the rejected Super-Spinner Beast and Gas Creature. Growth is Always On and Already Figured. Vibe must be channeled through the earth (cannot effect an airborne target) and has only 6 APs of Range, but can have a 3 AP Area Effect if desired. 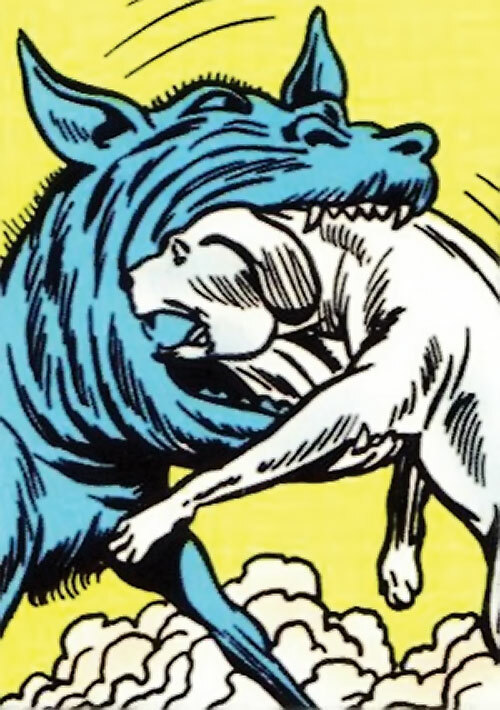 The Beast is immune to the direct effects of this attack unless its power is somehow reflected back against it. 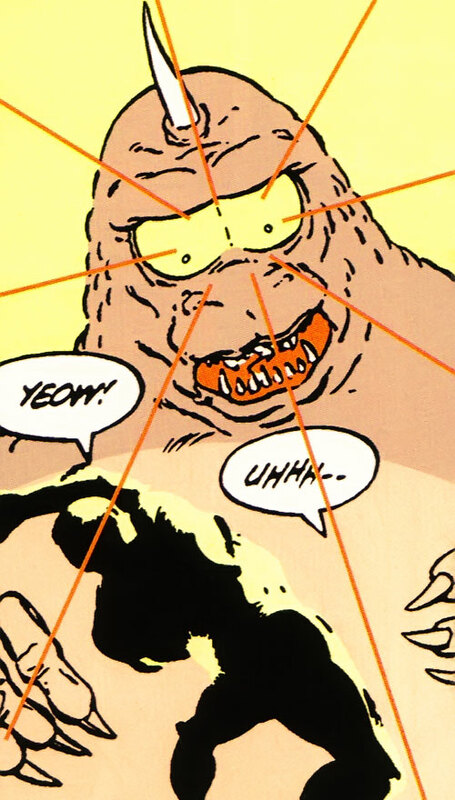 As noted above, the Earthquake Beast is from a planet known only as “Monster World.” As might be expected from the name, human efforts to colonize the planet have failed due to the uniquely powerful and dangerous creatures that have evolved there. 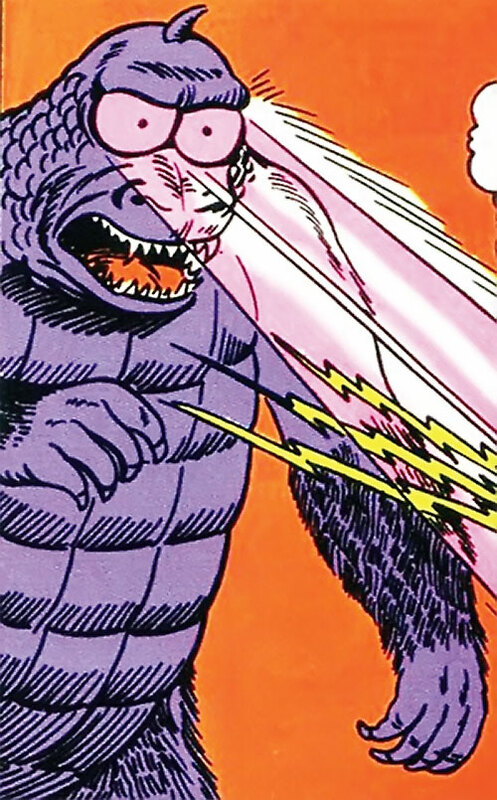 An Earthquake Beast was the anchor of Monster Master’s Legion of Super-Monsters. The Earthquake Beast is a greyish reptile which resembles a Terran dinosaur — something like a small brachiosaurus. Its size is difficult to estimate as illustrations differ widely. In general its body seems to be at least twice as large as an African elephant. With its long flexible neck and long ringed tail it measures 40-50‘ in length. It has a thick trunk, four sturdy legs capable of surprising speed and agility, and great jaws capable of a powerful bite, but its chief weapon is the tail. Ringed with vibrating rattles and pointed on the tip, the Earthquake Beast’s tail can easily be jammed into the ground. The rings vibrate and create devastating earthquakes. 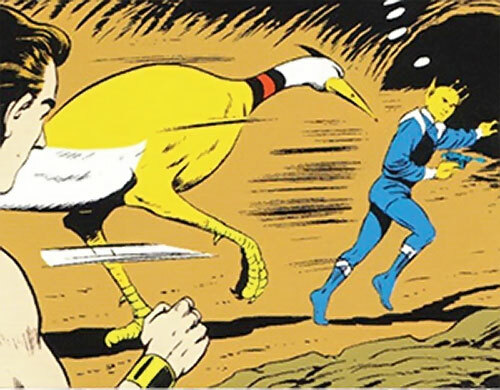 Bouncing Boy defeated the first Earthquake Beast by maneuvering it into striking a cliff wall, so that the creature’s own power buried it in rock. 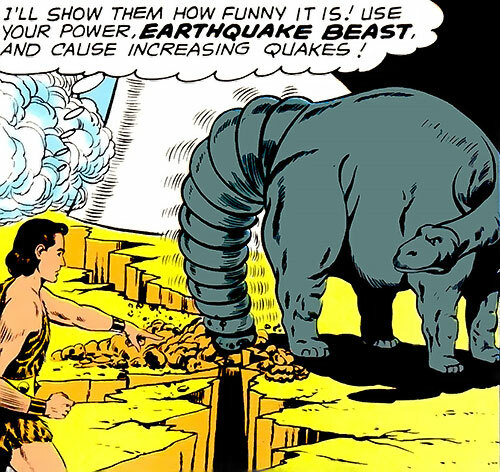 Years later a second Earthquake Beast was encountered on Earth when a zoo ship crashed at Metropolis Spaceport. The White Witch, drawing inspiration from Bouncing Boy’s previous encounter, cast a Reflection/Deflection spell which again caused an Earthquake Beast to be defeated by its own power. Flash Incapable of Multi-Attacks (-1). This is likely true of the other attack powers, see below. Another specimen from Monster World, Eye Monsters look vaguely like a wingless hippogryph, but are considerably larger than a horse. They have a beak and huge talons rather than a snout and hooves. The hide is mottled like a purple and black giraffe’s, while the head and tail are white. The Eye Monster has four long, flexible eye stalks which can presumably look in any direction. One eye shoots lightning, another has heat vision (Laser Beam), another fires x-rays, and the last emits blinding light. It is capable of using all its eyebeams at once, at independent targets. This is treated as a normal Multi-Attack, but each power can only affect one target. So 1 person would be blinded, another struck by lightning, a third scorched by a laser beam. Note that the function of its X-Ray eye is never made clear. It may be that this is an Energy Blast, with some slow-acting Poison Touch to represent lingering radioactivity. 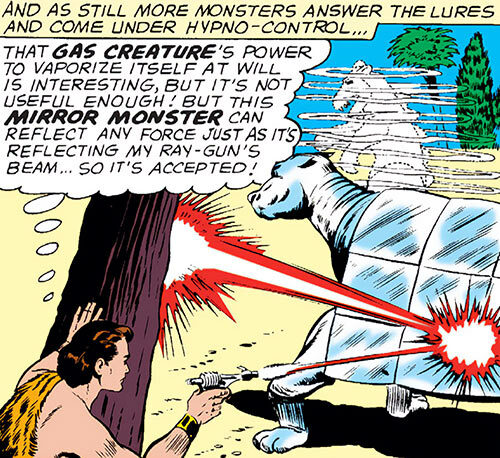 But the Eye Monster is a product of the Silver Age, so I’m guessing it was meant to imply X-Ray Vision matching its Heat Vision. Density Increase adds to STR as well as BODY, is Always On and Already Figured. 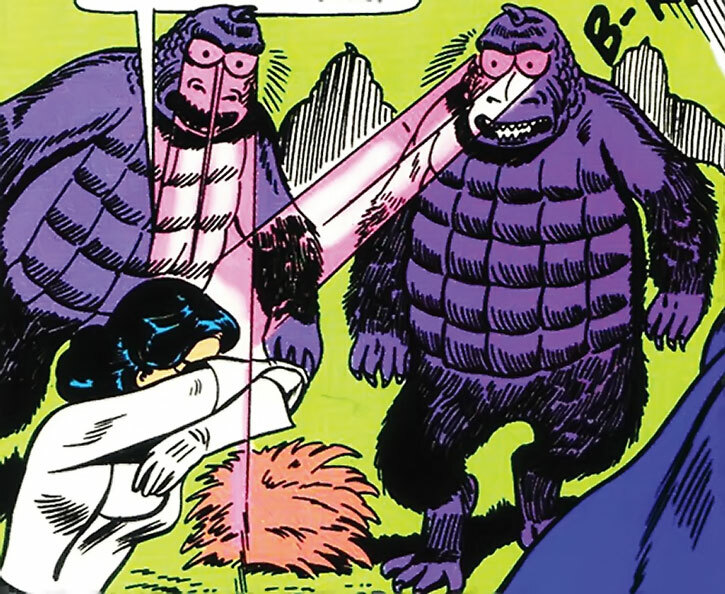 Mirror Monsters come from Monster World, and one was recruited for the Legion of Super-Monsters. They are roughly the size of a large cow, but perhaps more massive. They are pale white in color and are covered with reflective plates that can deflect laser fire or super-powers with equal ease. I suspect the plates may also function as armor — perhaps Skin Armor: 05. Density Increase adds to Str and Body, is Always On, and is Already Figured. 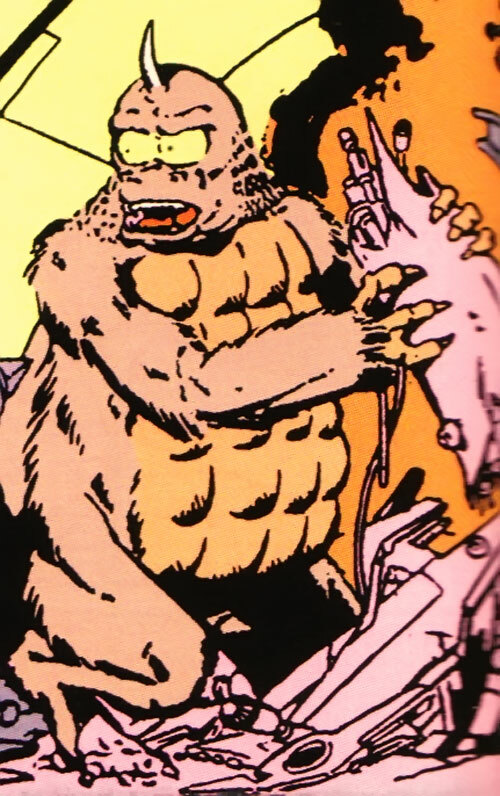 A Driller Beast from “Monster World” was a part of Monster Master’s “Legion of Super-Monsters” but eventually it was returned to the wild. Driller Beasts appear to be bluish, reptilian-looking creatures. They seem to be about the size of a crocodile or perhaps a large komodo dragon, as they are not slung so closely to the ground as a croc, and are taller and more massive. Their long snouts are actually shaped like a drill, and can power through bank vault doors with ease. 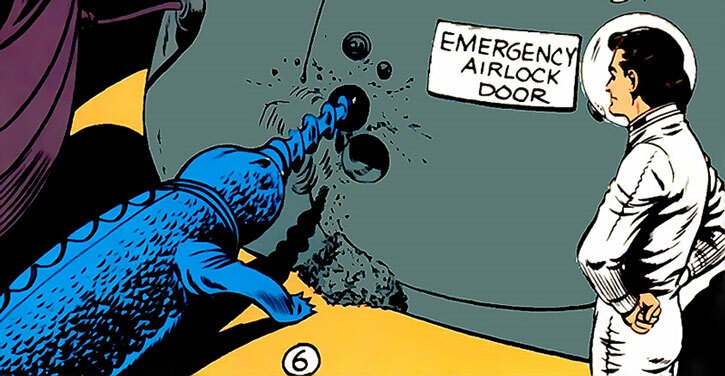 Curiously, the Driller also seemed able to operate in the vacuum of space, at least for a time. 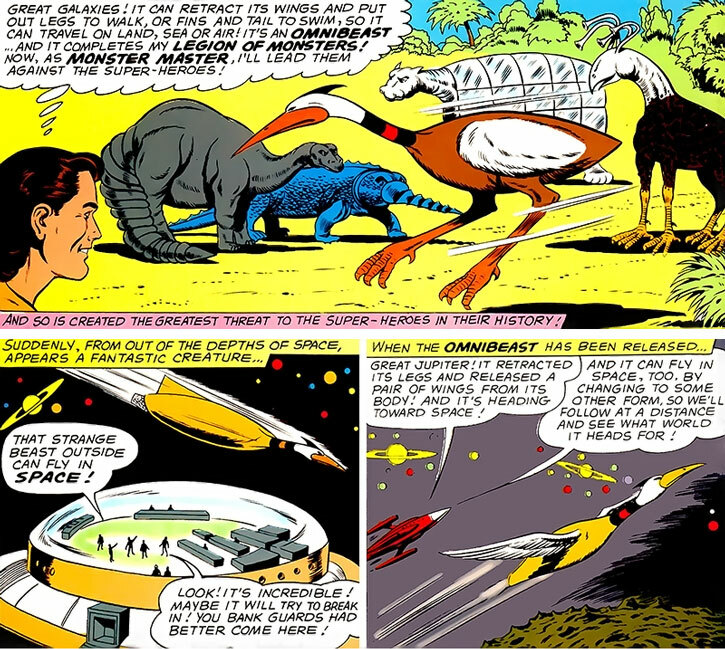 The Omnibeast of Monster World looks like a giant bird, but can adapt itself to any environment. It is very comfortable on the ground, running on two taloned legs like an ostrich. 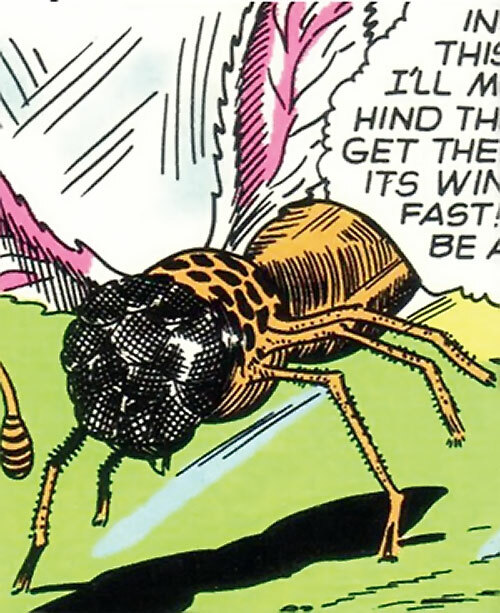 It can release wings from its body and fly, retracting the legs. It can even fly in space by retracting the wings and protruding a rocket-like appendage which “jets strange rays” (seriously). Reportedly it is also able to swim, both on the surface and under the water, by putting out fins and a tail. 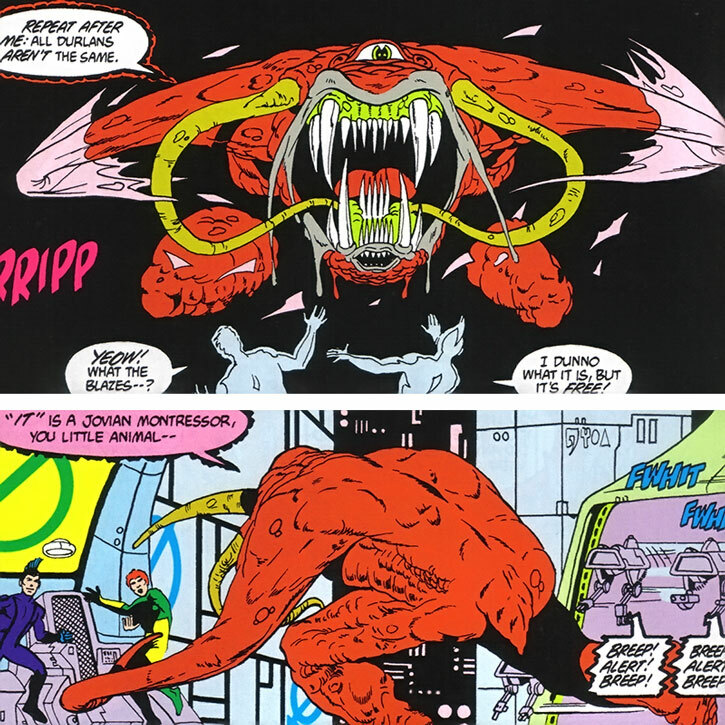 An omnibeast was drafted by Monster Master into his Legion of Super-Monsters. Air Control only creates whirlwinds centered on the Spinner Beast. Superspeed does not subtract from the time it takes to do tasks nor allow Multi-Attacks. The Spinner Beast has no apparent arms or legs. 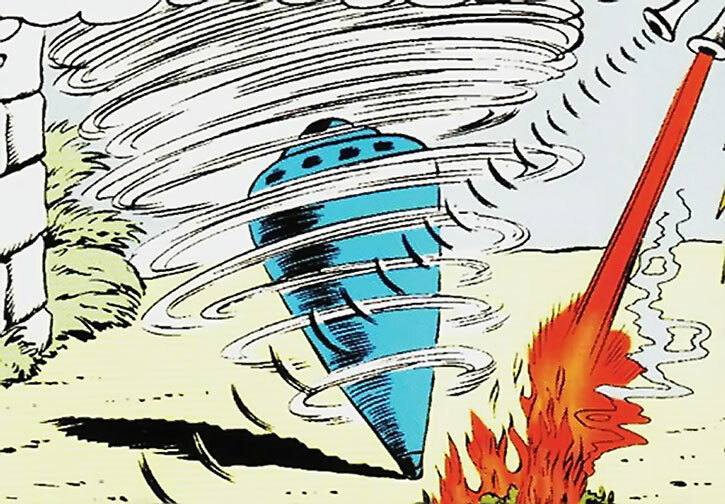 The Super-Spinner Beast of Monster World was passed over by Monster Master for his Legion because its tornado was too small to be of much use. Disintegration has a Range of Touch, and possibly can only be used on a Grappled target. The Gas Creature must activate Self-Link (Fog) when it activates Disintegration. Fluid Form is only usable in conjunction with Self-Link (Fog), representing the beast’s power to vaporize into a gaseous form. The Gas Creature of Monster World seemed to want to join Monster Master’s Legion, hanging around even after he passed it over. It may have been more intelligent than most creatures, intelligent enough to want to belong and to resent being passed over. 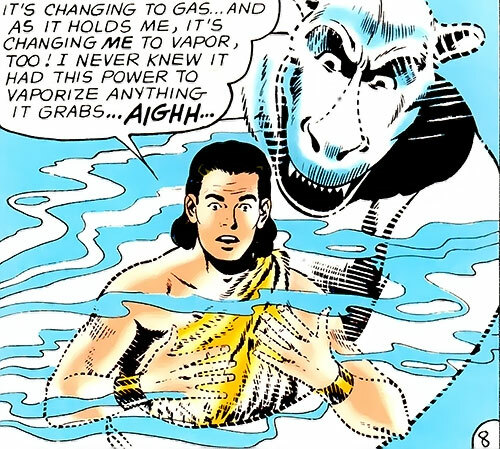 Monster Master felt the Gas Creature’s ability to vaporize itself was interesting but not powerful enough for his Legion. He died when the Gas Creature attacked him, revealing an unsuspected ability to vaporize whatever it grabbed. Monster Master dispersed into a gas, but unlike the Gas Creature he never rematerialized. After Monster World, the jungle planet of Vorn has probably the richest variety of strange and dangerous creatures anywhere in known space. Known as the Hunter’s World, human colonies on Vorn mostly failed, and only one small city remains. That city serves mostly as a home base for hunters and trappers from many worlds who hunt the exotic and sometimes dangerous game to be found on Vorn. 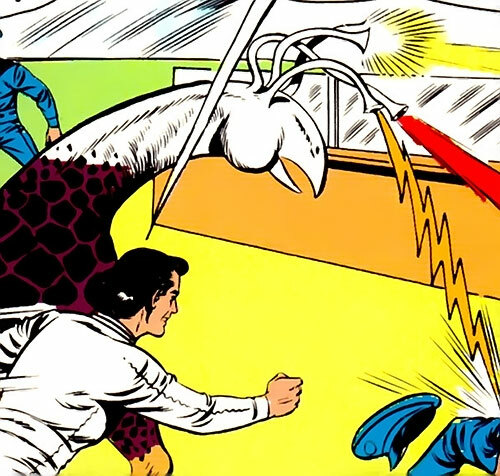 A few years after the LSH dealt with Monster Master, they dealt with another would-be hero gone wrong. Beast Boy of the Heroes of Lallor (who will get his own profile eventually) tired of human prejudices against shapeshifters and sought to find a world without humans. Going to Vorn, he used his powers to get the native creatures to cooperate and drive the few humans living there out. 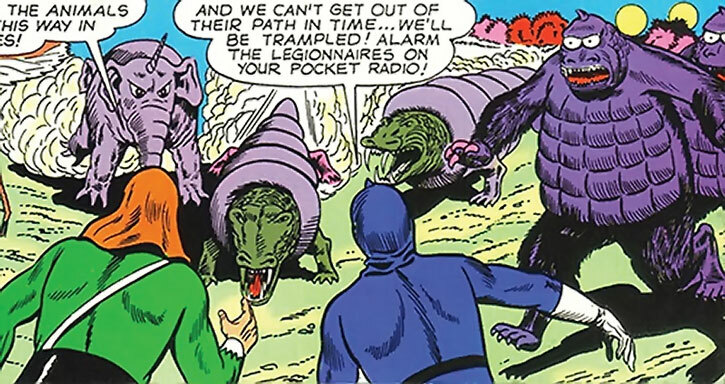 The Legion was sent in to investigate and clashed with Beast Boy and many creatures of Vorn, including Dralgos, Flasher Beasts, Sliths, Torks, Vornian moles, Vrans, and at least one Maw. 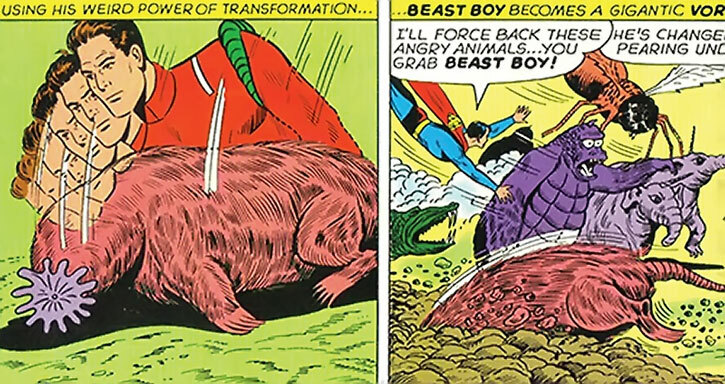 Beast Boy ended up heroically sacrificing his life to save a human child from one of the beasts he had set loose, and conditions on Vorn returned to normal. Martial Artist can only be used while the Dralgo is in flight (including the +1 Initiative bonus it carries). Growth is Always On and Already Figured in (-1). Dralgo are native to Vorn. They are enormous (10‘ long or more) insects, reminiscent of house flies. These insectoid creatures have smooth orange bodies, six legs, a pair of pink transparent wings, and a multi-faceted single eye. Dralgo are omnivorous, eating fruit, especially the fruit of the Lian tree, as well as animals. 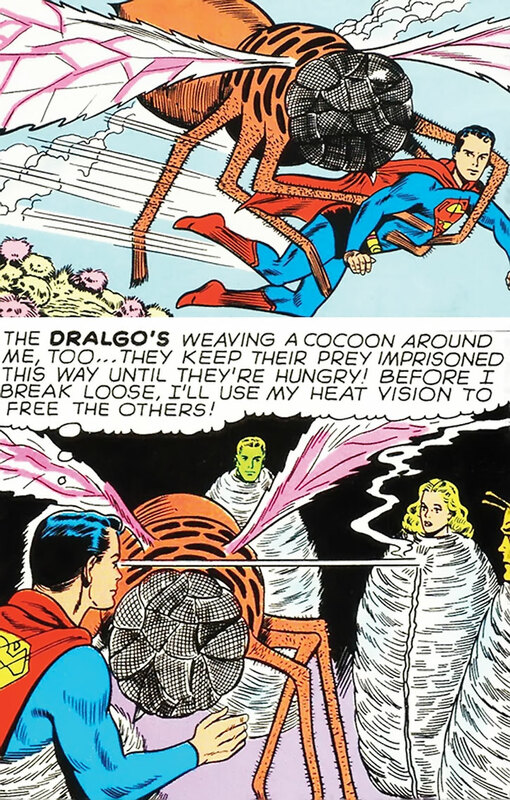 Enormously strong, Dralgo have been known to swoop down on adult humans and carry them away, imprisoning them in a cocoon of webbing (Glue) until hungry. Dralgo are incredibly fast and agile fliers, able to outdistance and outmaneuver a Legion Flight Ring. 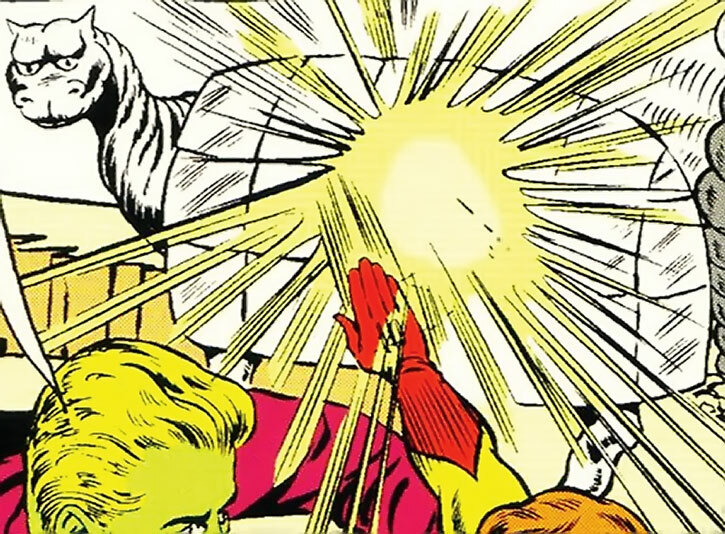 Flash emanates in a cone from the Flasher’s eyes. It is thus incapable of Multi-Attack (-1) but has the equivalent of Scattershot (+0). MIF of opponents not affected by Flash. Flasher Beasts are 14-20‘ tall primate-like creatures. They are heavyset and have thickly matted fur covering their bodies. Some are gray, others are red and brown. They walk upright on webbed feet, have arm-like forepaws with long claws, and sport a foot-long horn from their foreheads. Size, strength, and claws are not their primary weapons, though. Flasher Beasts incapacitate their prey (including humans) by radiating dazzling flashes of light from their eyes which temporarily blind victims. Flasher Beasts, like the Dralgo, are native to the hunter’s world of Vorn. They are sometimes captured and exported for zoos. 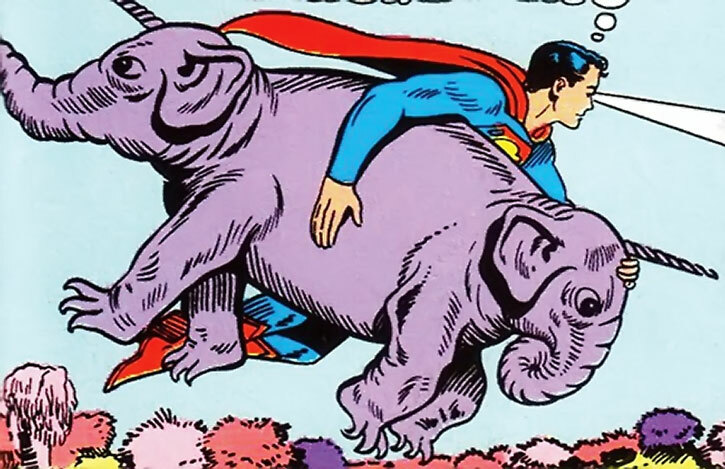 A Legion Academy training team once helped recapture escaped animals from a crashed zoo ship, including a Flasher Beast. Growth is Always On, but only on the Maw’s head, which has a STR of 06 and a Physical RV of 05. Shrinking is Always On, but only on the Maw’s body and legs. A Trick Shot will allow an opponent to target the Maw’s body instead of its Growth-enhanced head. 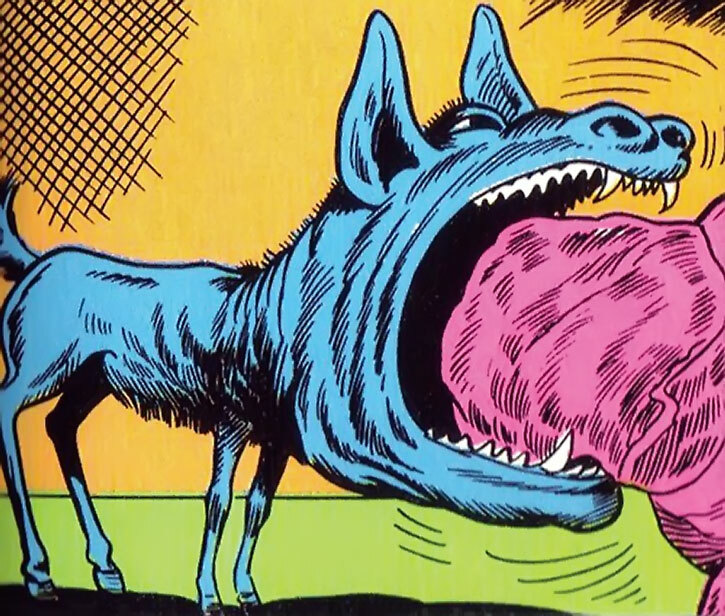 The Maw of Vorn is an extremely odd-looking canine offshoot with a small body, spindly legs, and an enormous head with tremendously wide jaws. Its cavernous mouth requires constant feeding, as the creature eats twice its body weight daily. Though the Maw, like a Bismollian, can and will eat almost anything (vegetation, machinery, rock), it is carnivorous by preference. It will generally attack and consume any creature it encounters. Beast Boy was killed saving a little girl from a ravenous Maw beast. All Powers are Always On and Already Figured. Note that Density Increase adds to STR. 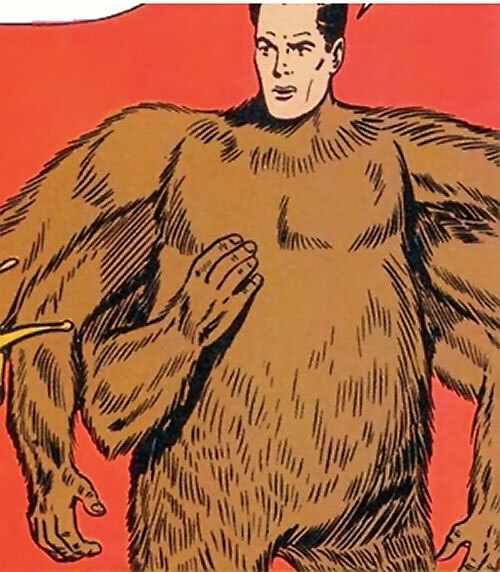 The Slith is a six-armed ape resembling a brown gorilla. 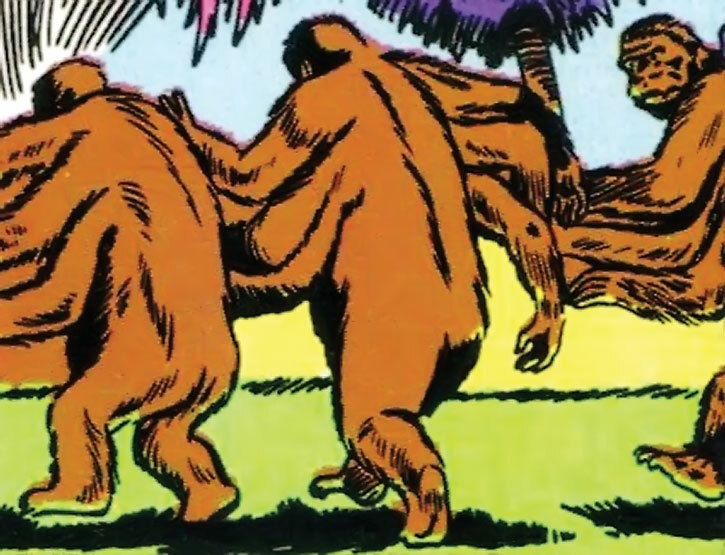 They move in groups and are native to the hunter’s world of Vorn, although there are reports that they may in fact be genetically modified versions of Terran gorillas. They primarily live in forest and jungle areas and walk upright. They rely on grappling attacks in combat, using their extra arms to best advantage. The Tork is one of the strangest animals of Vorn. It resembles a small, two-headed elephant. The tork has no tusks, but sports a unicorn-style horn from the center of each forehead. The most remarkable feature of the tork is the placement of the heads — they are not side-by-side, but located on each end of the creature, facing opposite directions. It is as if the head and front half of an elephant is attached to the front half and head of another elephant. Despite this oddity it has no trouble running or navigating and is very difficult to catch by surprise. Vornian Moles are burrowing mammals with long tails and pinkish fur that are generally 6’ long. They are retiring beasts that would far rather flee than fight. Vornian moles are capable of using their tails in a sweeping motion that closes the tunnels they make behind them, making pursuit extremely difficult. They dig so quickly that they can tunnel at their normal Running speed. Skin Armor is partial and can be avoided with a Trick Shot at the head or feet. The Vran resembles a rhinoceros-sized alligator with a thick metallic carapace of huge purple rings covering everything but its legs and its head. Contrary to some reports (such as Mayfair’s LSH v.1 Sourcebook), it is swift and potentially vicious. Its carapace limits maneuverability, however, and like a turtle, it is fairly helpless if somehow toppled onto its back. This section details those creatures improbably identified as being from our own solar system, mostly from Jupiter and Saturn (or their moons). Other creatures are noted as existing on Venus and Mars, but so far none of those are important enough to profile. Using these creatures may require an unusual level of suspension of disbelief, since the existence of such creatures is vanishingly unlikely. 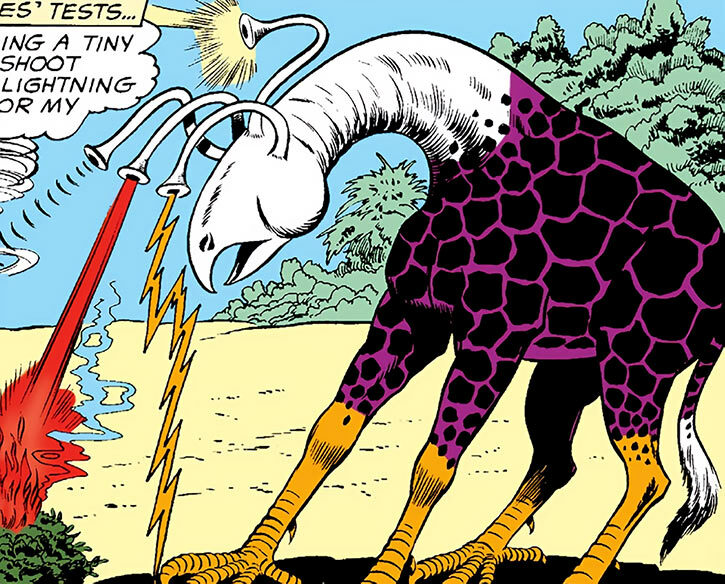 We can’t even dismissively cite the Silver Age, since many of these critters are from the 80s. But some of them (such as the Saturnian Tentacaglor or the Jovian Montressor) are highly impressive looking, and are staples for Chameleon Boy’s shapechanging. So they’re a “must have” for the alien animals file. Of course, some of these creatures may be products of genetic engineering. Venus is home to several odd creatures, for instance, and the Venusian colonists are known to have a great hatred of transmutation, shapeshifting, and genetic manipulation, considering these things to be evil. This implies that those things may once have had dire consequences there. Other creatures may be escapees or transplants from other solar systems. They may even be extra-dimensional, coming through a portal from Skartaris, a Nexus to All Realities, or a Hellmouth. Use whatever rationale you need to make them work, and feel free to adjust their stats accordingly. Many of them may need Sealed Systems or Life Support, for example. If you choose to make them extra-dimensional, semi-demonic creatures, they may have some Mystic Linked powers. The creatures currently detailed in this section are the Jovian Attack Squid, Jovian Camelephant, Jovian Montressor, Saturnian Scorpion Beast, Saturnian Tentacaglor, and Saturnian Tri-Hydra. 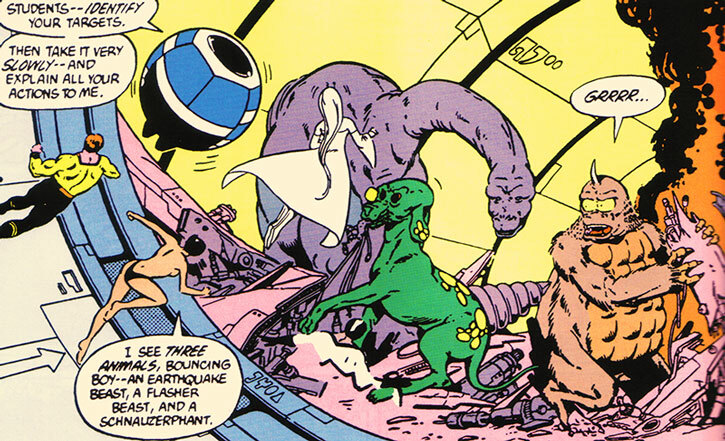 I didn’t bother to include the Venusian Sneep (a pink furry critter which terrifies some elephant-like animals – use mouse stats with 2 less APs of Shrinking). 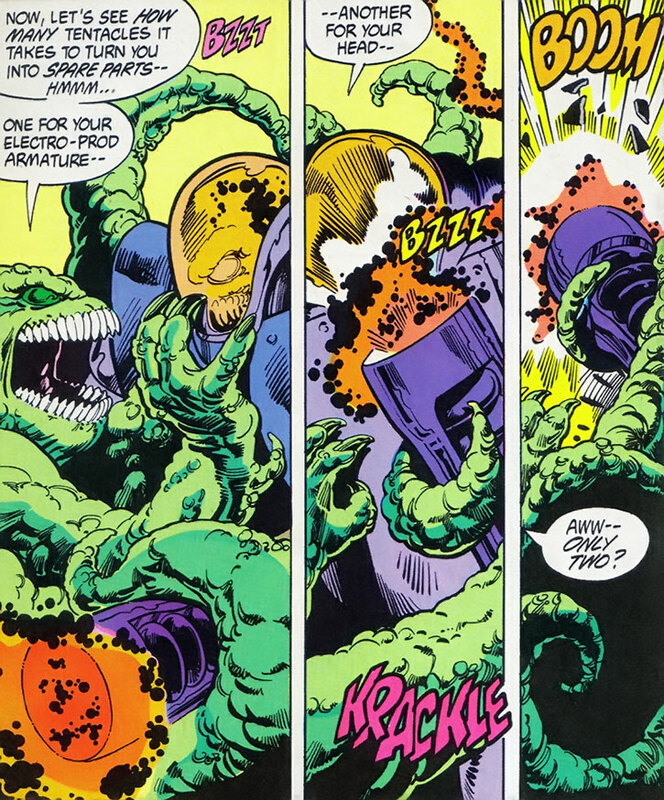 The Venusian Octopus Vine will be featured in Section VII, which focuses on carnivorous and ambulatory plants. Air Walking and Swimming work best in water or the thick, soupy atmosphere of Jupiter. In a standard Earth atmosphere, subtract 1 AP from Swimming and make Air Walking Fatiguing. The Attack Squid can fly/swim/whatever for a bit, but will quickly tire. This beast is one of the deadliest monstrosities in the Terran solar system. It’s a huge animal, with a body about the size of a rhino, with a light green hide and dark green spots. Its head is shaped something like a pterodactyl, orange with a yellow “beak”, but with rows of razor-sharp teeth. The beak is approximately the size of an adult human. The attack squid also has six tentacles and a tail (which is only distinguishable from the tentacles in that it comes from the creature’s rear instead of its sides). This equates to Extra Limb (x5) – two tentacles are “standard”, there are four additional tentacles, plus the tail. Its tentacles are in fact “fins” with suckers like those of an octopus or a squid, which serve to propel its mass easily through Jupiter’s thick atmosphere. It maneuvers less well in a Terran atmosphere, but is still able to “swim” through the air a bit. It will quickly tire and collapse back to the ground, however. Growth is Always On and already figured into STR. 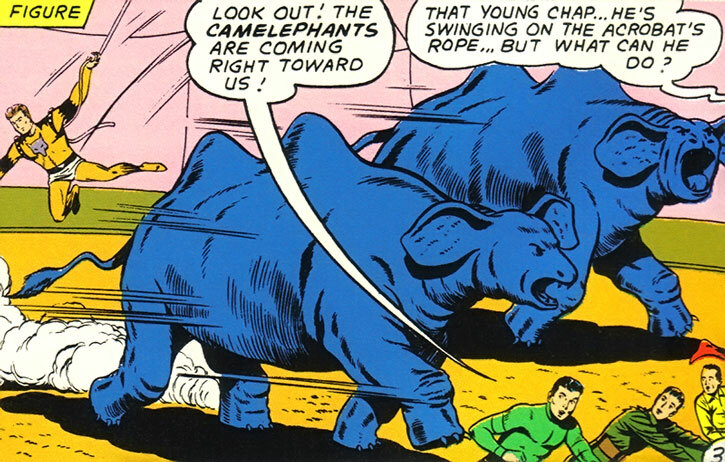 Jovian camelephants appear in Adventure Comics #326, reprinted in Legion Archives v. 3. These huge circus creatures are panicked into stampeding, but the stampede is halted by Lone Wolf, who would later become Timber Wolf. This was the Legion’s first encounter with him. As for the Camelephants themselves, little is known about them and their stats are very speculative. 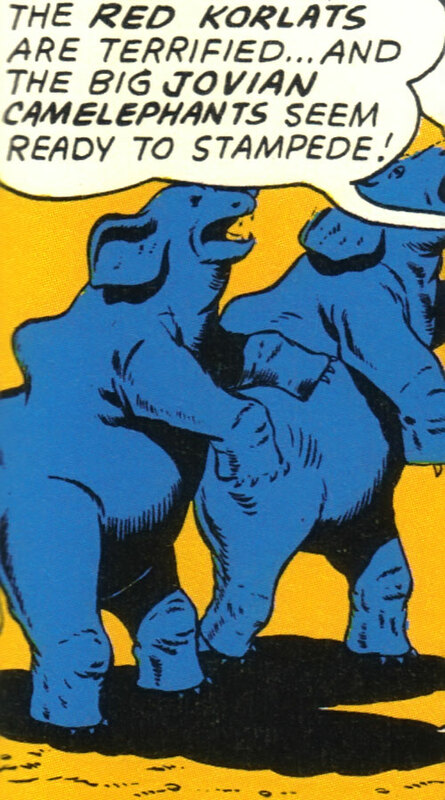 They are blue, massive, and shaped much like an elephant. 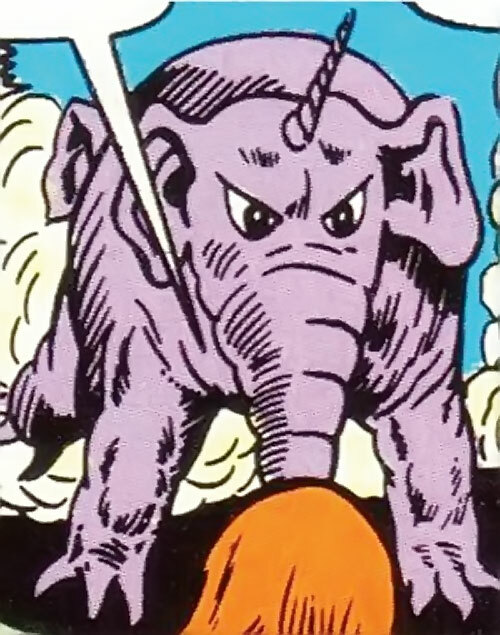 They have a ropy tail and big ears (my justification for their elephant-like hearing), but no trunk. They have two humps on their back, like a camel. Each leg is the height of a person, but far thicker and more massive. Their home environment — whether on Jupiter or one of its moons, terraformed or otherwise — is not revealed, though they are comfortable under Earth-like conditions. GMs might consider whether they have a camel’s ability to go without water for long periods. When startled, camelephants may rear up on their hind legs, almost to the point of standing upright. Extra Limb represents the Montressor’s two tentacles. Growth is Always On and Already Figured in. Stretching is usable only with the tentacles, allowing the Montressor to attack foes 1 AP distant from itself — it thus has No Fine Manipulation (-2 FC) and no RV-increasing component (-1 FC). This monstrous 14’ tall predator has only been encountered by the Legion when Chameleon Boy has assumed its form — a useful one in a fight. The montressor has tremendous strength and brute power, with rock-hard brownish skin, two think-trunked legs, two powerful arms, and two long tentacles which give it tremendous reach. It has a single, huge eye (like a cyclops) and a gaping maw with double rows of long, sharp teeth. It’s unclear whether the montressor is actually a native of Jupiter or, more likely, is from one of Jupiter’s moons. Stretching has No Fine Manipulation (-2) and no RV component (-1) and represents the long reach of its stinger (Extra Limb x1: 10). The Saturnian Scorpion Beast is another contender for the title of “most dangerous creature” on this list. 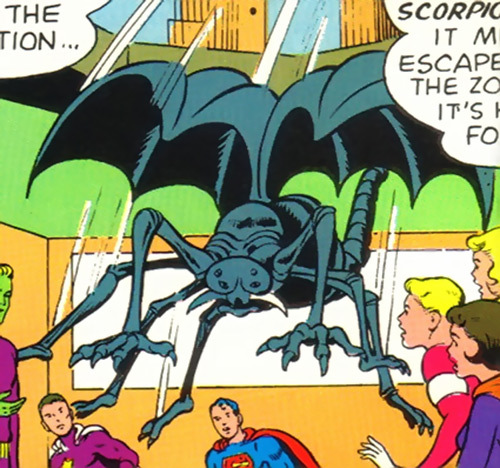 It’s a giant bat-winged scorpion that drips acid from its talons. Proty II once impersonated one at Superboy’s request, but wasn’t able to copy its Acid touch. Growth is Always On and Already Figured (including Extra Limb). Stretching has No Fine Manipulation (-2) and no RV component (-1) and represents the long reach of the Extra Limbs. The tentacaglor is a 12’ tall green or brown mass of muscle, with emerald green eyes, 60 remarkably even teeth, two very powerful arms, and 6 long tentacles that are nearly as strong. It is rumored to secrete acid sweat – this is unconfirmed, but if true is Acid (touch only): 05. It is native to the swamps of Titan, one of Saturn’s moons. 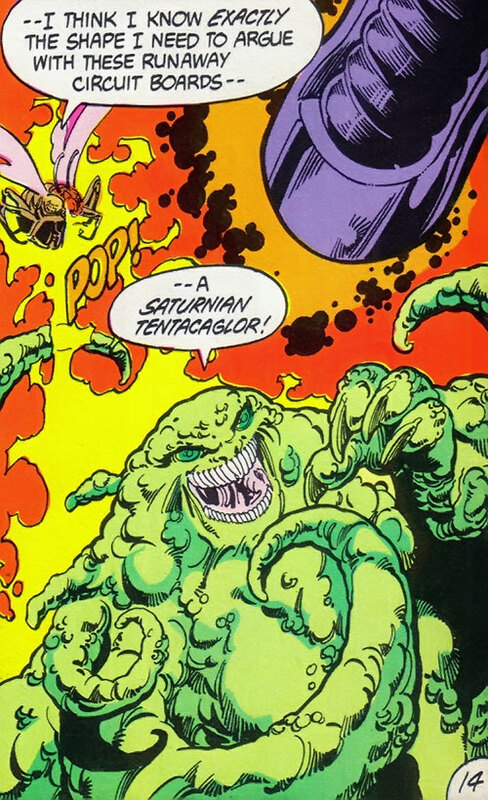 Like the Jovian Montressor, the Saturnian Tentacaglor is one of Chameleon Boy’s more combat-worthy shapes. Poison Touch must be Combined with Claws (Bite); positive RAPs must be scored on the Claws attack before Poison Touch can be used; continuing attacks from the poison only occur every 5 Phases; Poison Touch has a Minor Power Burnout. 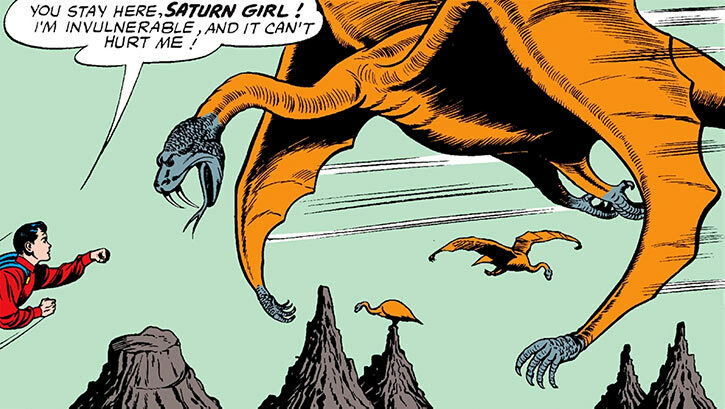 Like other “Saturnian” creatures in the chronicles, the Tri-Hydra is probably from Titan, but this is unconfirmed. 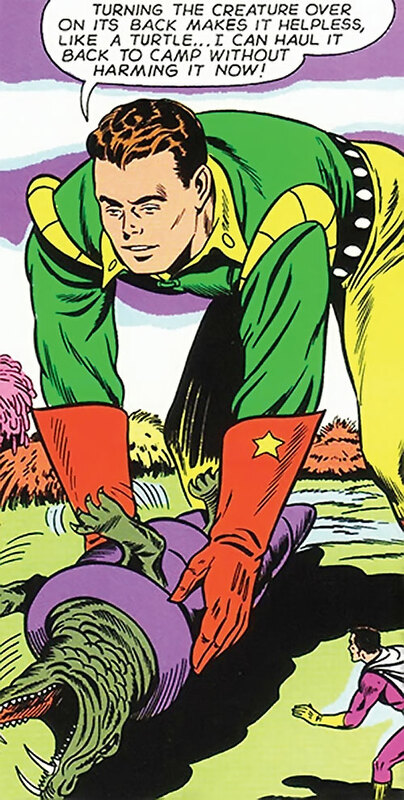 The only one encountered in LSH stories was actually the shapeshifting Proty II – who was trying to come up with a shape that might frighten Legionnaires. Judging from Proty’s impersonation of the formidable-looking creature, its three fanged heads are likely venomous. 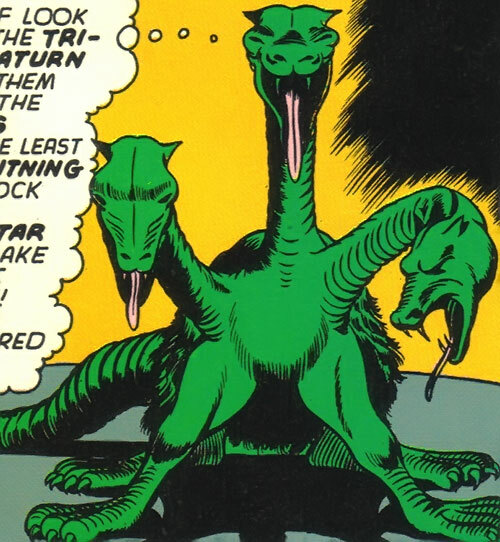 Four-legged, green-scaled, with a suggestion of feathers around its body (which is about the size of a large dog), with three sinuous, fanged heads, the Tri-Hydra is mostly reptilian with some avian features. If you want to go for a full-on horror effect, you could give the heads regenerative properties (Regeneration or Invulnerability) like the mythological hydra after which it is named. There’s absolutely no material to support that apart from the name, but it would still be cool. Note that the mythological hydra would not sprout new heads when the wounds were seared with fire. These are alien animals who appear outside of the main material. Misc. : Some minutes after a taroc dies, a baby taroc will emerge from their body and take flight. The name of the planet where tarocs live isn’t given, but these beasts are somewhat famous — as they are said to be reborn as soon as they die. 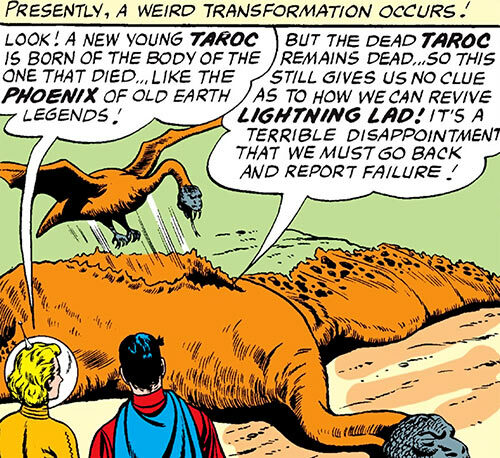 When Mon-El and Saturn Girl investigated this phoenix-like resurrection, they discovered that when a taroc died a baby taroc emerged from the corpse. Since the baby immediately knew how to fly and hunt, it is possible that some sort of consciousness transfer or experience transfer takes place. 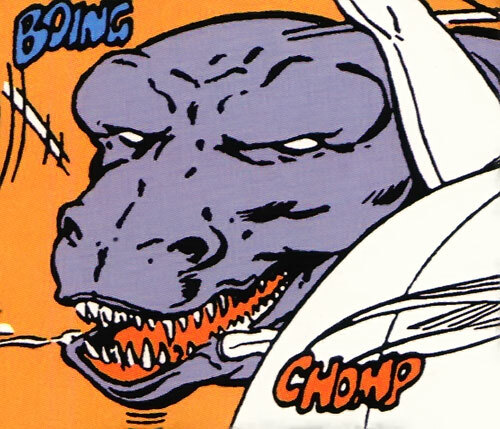 Taroc are aggressive predators, and appear in Adventure Comics #312. Parakats are a rare lifeform found on XXXth century Xanthu, Star Boy’s homeworld. 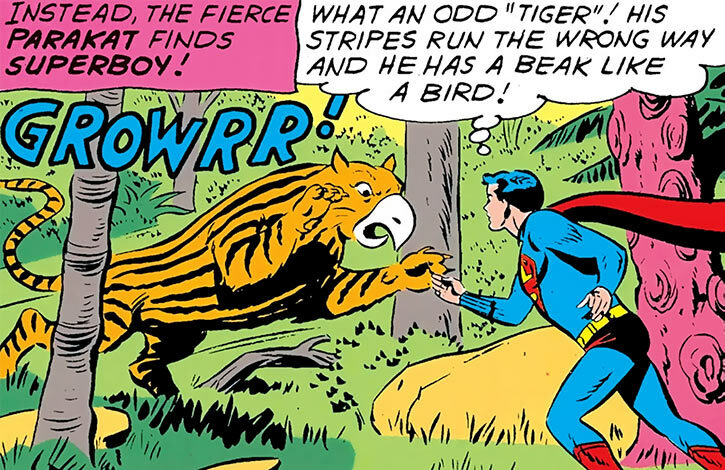 They are very much like tigers, but with a beak – and horizontal stripes in their fur. Parakats live in a specific milieu – thick jungles found on mountaintops in lieu of snow. Parakats can talk. 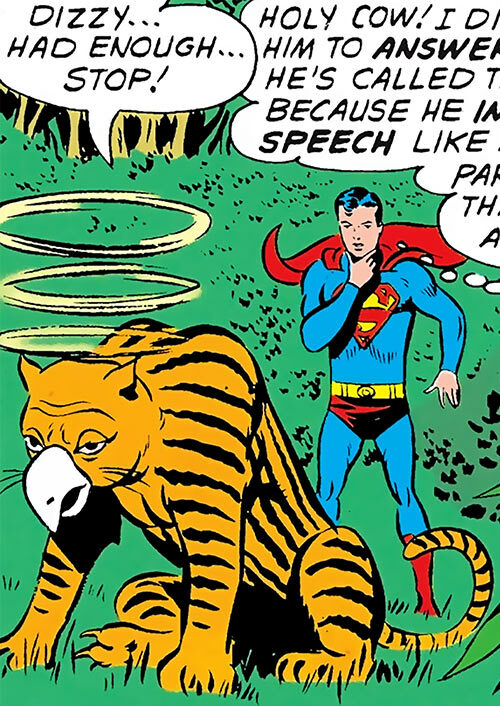 Though Superboy thought it could just repeat words it had heard like a parrot, the parakat’s halting speech was context-appropriate and seemed sapient . Albeit they seem similar to tigers, parakats are a reasonable sort and will surrender if outmatched. It is possible that Xanthu recognizes them as sapient beings and preserve their traditional habitat. Our game stats assume that they can somehow “repeat” any language they hear and thus communicate with all manners of sapients. 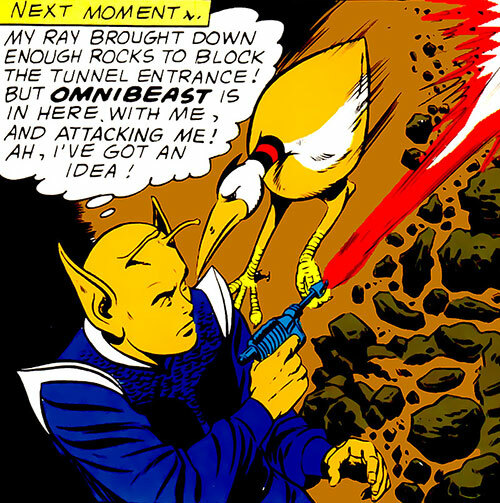 A parakat appeared in Adventure Comics #356. Mayfair Games published stats for some of these critters, both in the LSH Sourcebook volume 1 and in Chameleon Boy’s Who’s Who profile. The versions here, however, are completely rewritten based on new research from the comic books. When a Mayfair writeup has mentioned powers not in evidence in the comics, I’ve included that information in each creature’s Background. I’ve focused on the Pre-Crisis era for these depictions, as there is far more information available during those decades, but I’m not opposed to post-Crisis data. As far as I can tell there’s nothing here that is not compatible with most post-Crisis versions of the LSH. As mentioned above, most of these creatures are only seen a couple of times, so finished game stats required some educated guesses. For the most part I’ve been conservative and limited their Powers to what’s demonstrated in-story. Most of them likely have additional abilities, especially heightened senses. Feel free to add to what I’ve listed here, and check out the Animals file on WORG for ideas. Generally animals don’t have “powers” as such, just physical traits that differ from human and are represented by DCH Powers — for example, wings enabling Flight. As such, their abilities usually will have the Form Function Bonus (see the New Rules section on www.writeups.org), and so cannot be Neutralized, Drained, copied via Mimic or Adaptation (but can be copied by Shape Change, Animal Mimicry, and Zoomorph), etc. This may be less true for these alien animals than for their Terran counterparts, however. For example, a Lightning Monster of Korbal has Running which can’t be Neutralized short of hobbling it or cutting off a leg. But it’s Power of Lightning might still be Drained or Neutralized. GM discretion will have to rule in those borderline cases. As with the standard Animals file, the question of how to represent an animal’s size needed consideration. Elephants and Earthquake Beasts don’t actually have a growing power, so why do they have Growth? In game terms, I’ve treated each animal as if it were a Player Character (PC) with a normal (human) PC’s size, weight, and so on. To get the creature to its correct weight and size I applied appropriate APs of Growth (if larger than human), Shrinking (if smaller), and Density Increase (for creatures more massive and heavy than human, but not necessarily longer or taller). Such Powers are Always On, meaning the animal can’t change size or density, and because of that, you don’t need to adjust their Strength (or other attacks, like Claws) or movement speed. Their size and density is already figured into their Attributes and Powers. Not only does this make bookkeeping simpler, it also makes it easy to figure out how the use of powers like Enlarge or Diminution affect animals. I suggest that if Enlarge is used to make a small animal bigger, each AP of Enlarge will cancel 1 AP of Shrinking. If an alien bug with 11 APs of Shrinking (Always On) is targeted with the Enlarge Power and the Enlarge attempt receives 11 RAPs, that bug will now be roughly human sized. If the Enlarge attempt receives 12 RAPs, it will be slightly larger than human, as if it were a human using 1 AP of Growth. Likewise, if it received 10 RAPs on the Enlarge attempt, the bug would be slightly smaller than a normal human, like someone using 1 AP of Shrinking. The same process, in reverse, would apply to Diminishing animals that are larger than human to start with. Note should you Enlarge an animal, you will probably also be increasing its movement speed, STR, and Claws. Diminishing an animal will likewise make it slower, weaker, and its Claws, if any, less dangerous. Helper(s): I used the Animals File on writeups.org, which has profiles of many different Earth animals, as a starting point for these alien beasts. Other help came from Sébastien Andrivet (his Geo-force power, which can be found in the New Rules section of writeups.org, helped with the Earthquake Beast, and he wrote the profile of the tarocs and parakats); Eric Langendorff; William Chamberlin; and various products from Mayfair Games DCH RPG, including the LSH sourcebook vol. 1 (30th Century Bestiary), the Mayfair Who’s Who writeup of Chameleon Boy, and the World at War sourcebook (dinosaur stats). 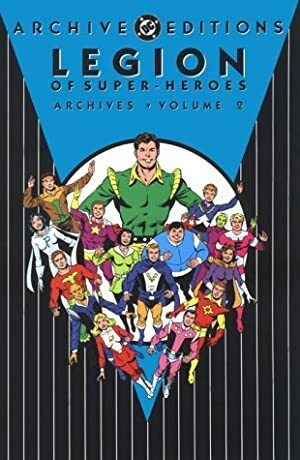 Legion of Super-Heroes Archives vol. 2. 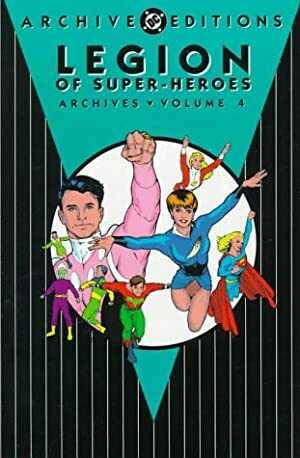 Legion of Super-Heroes Archives vol. 4.